This image was taken from NOAA's GOES-13 satellite on Saturday, Feb. 9 at 7:01 a.m. EST. Two low pressure systems came together and formed a giant nor'easter centered right over New England creating blizzards from Massachusetts to New York. A satellite in orbit captured the birth of mega-snowstorm Nemo Saturday (Feb. 9) as the blizzard dumped feet of snow on New England and other parts of the Northeast. 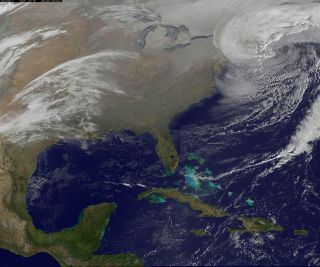 The video of snowstorm Nemo from space was recorded by the GOES-13 weather satellite from Thursday (Feb. 7) through early Saturday, as two low-pressure weather systems collided to form a single, giant nor'easter. According to NASA's GOES Project officials, "the two systems came together and created a blizzard of historic proportions in New England." "On Feb. 9 at 4 a.m., hundreds of thousands of people were without power in Massachusetts alone," GOES Project officials wrote in a video description. Snowstorm Nemo buried much of the Northeast in more than 2 feet of snow, with the storm being blamed for at least four deaths, according to press reports. The GOES-13 satellite video shows the storm form over two days as a powerful Alberta Clipper system carrying cold Arctic air from Western Canada slammed into a low-pressure system that moved northward from the Gulf Coast in the south. GOES-13 is operated by the National Oceanic and Atmospheric Administration (NOAA), which oversees a fleet of Earth-watching satellites with NASA to monitor the planet's weather systems.